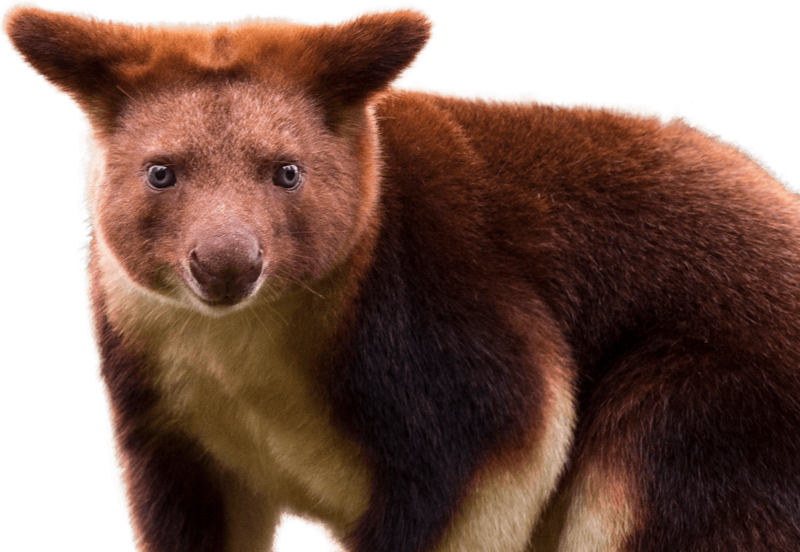 Like other tree kangaroos, a Goodfellow’s tree kangaroo differs noticeably from the better-known ground kangaroo because it has developed specialised adaptations to its arboreal lifestyle. These include shorter hind limbs, strong, stocky arms, and a long tail for balance while leaping among the branches. The feet are also broader than those of ground kangaroos, and have padded soles to aid with gripping and sharp curved claws for climbing. This slender-bodied tree kangaroo has short, usually woolly fur that ranges from chestnut-brown to crimson, with a paler underside, grey-brown face and yellow neck, cheeks and feet. A characteristic pair of golden stripes runs down the centre of the back and each individual has a unique pattern of yellow rings and blotches on the tail. Males are slightly larger than females. Like many forest dwellers, the Goodfellows tree kangaroo is fast losing its habitat. Rapid deforestation combined with hunting has left fragmented populations of decreasing numbers. There are currently no direct conservation measures in place for this endangered species. The National Zoo and Aquarium is part of a breeding program to help at least maintain a captive population. The National Zoo & Aquarium is home to 2 tree kangaroos; Oumak and Simbu.